Dennis and SISIS have concluded their successful â€˜on the greenâ€™ education seminars for spring 2014. Dennis and SISIS have concluded their successful ‘on the green’ education seminars for spring 2014, with a promise of further dates to be added for later in the year. The event was started with an introduction and welcome from Ewen Wilson, Dennis and SISIS area sales manager. This was followed by a presentation from Patrick Hulbert of Bowls International magazine, and a former international player, on what players want from their bowling green. Patrick then gave attendees an update of Bowls England, the sport’s governing body. 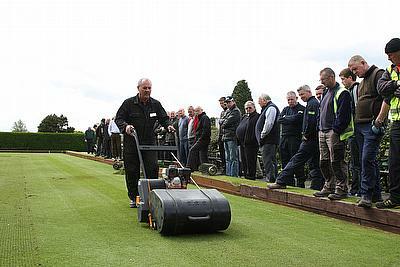 The morning session was concluded by an ‘on the green’ demonstration of the bowling green maintenance equipment from both Dennis and SISIS focusing on the benefits scarification, aeration, verticutting, brushing and cutting bring to a green. After lunch, Matt Gresty from Limagrain discussed choosing the correct grass seed for a bowling green along with spring maintenance and how to control weeds and moss before Alan Ronaldson from Dennis and SISIS gave an in-depth presentation on mower maintenance, service intervals, and tell-tale signs of neglect & what to look out for. The day finished with the infamous ‘turf clinic’ question and answer session. Further educational seminars will be planned throughout 2014. Further information about the range of bowls maintenance products available can be found by visiting www.dennisuk.com / www.sisis.com.